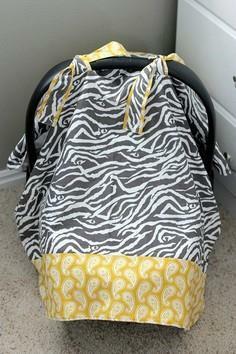 "no sew shopping cart cover by little rays of sunshine love this idea.soft comfy and baby isn't touching germy shopping cart!" "Kim from Sunshine Designs shows how to make a shopping cart cover to protect a baby from shopping cart germs. Sew the bias tape around the entire edge of the new seat cover to cover the raw edges. Cover the raw edges of the strap holes in the same way. Cover the raw edges of the strap holes in the same way. Press the folds on the cover with the iron to help the new cover take its shape better.